We give you more ways to profit. Earn competitive margins on today’s best-selling newspapers, magazines and high margin alternate products. We provide reliable delivery, easy billing and periodicals are risk free – unsold copies are returnable for credit. But that’s not all. In exchange for prominent display, selected magazine publishers pay Retail Display Allowance (RDA). That’s up to 10% of cover price in addition to NDA’s rate and we pass-through 100% of any RDA to you, weekly. It’s easy to get started and we can deliver tomorrow. Choose from hundreds of titles. Order today and profit tomorrow. 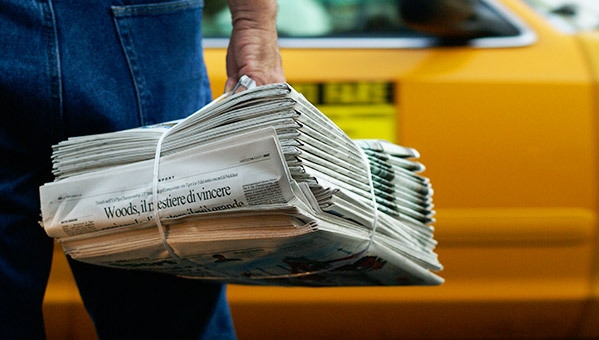 Newspapers drive daily foot traffic to your store. In fact, the daily newspaper is often the reason customers shop in your store. It’s an habitual buy and anchors customers’ total purchase. Reduce your costs by working with just one distributor. Stop paying multiple vendor service fees. Get one periodical delivery each morning and one consolidated bill each week. Buy all your newspapers and magazines from NDA and save. Working with just one provider is a much better use of your time and much more cost-effective. Check the status of your delivery route or for important messages from NDA at any time with our automated lookup. Need help understanding your bill? Check out our step-by-step explanation. Follow these 5 easy steps to getting credit for your returns. Questions about your account? Check route or account status anytime without waiting by calling our automated phone system. In NYC, call 718.937.0402. Elsewhere, dial 1.888.327.6397. Periodical sales are without risk – 100% of unsold newspapers and magazines may be returned for credit and it’s easy to qualify for return credit. We deliver the titles your customers buy most. Get the delivery you need, on-time every day. We deliver what you can sell. Returns are minimal. Choose from hundreds of titles – local, national and ethnic newspapers and magazines. We’ll even help you order! And ask us about special marketing opportunities and free display racks. Our drivers and sales staff are professional, dependable and courteous. Special instructions? No problem. Your order will be secured and waiting for you when you open. Introducing a new way to make even more profit with NDA. We sell a wide selection of high margin products in addition to newspapers and magazines. Earn up to 50% margin on alternate products. Learn how.